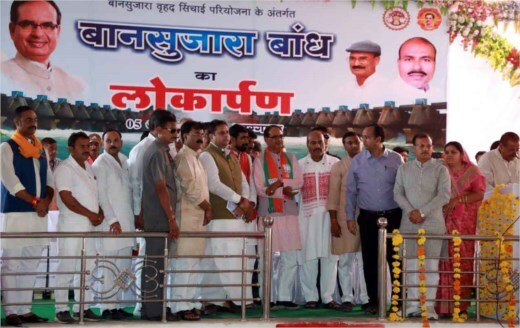 Chief Minister Shivraj Singh Chouhan dedicated Bansujara Dam Project in Khargapur Tahsil Head Quarters of Tikamgarh district on October 5. He also performed e-bhoomi poojan and e-dedicated irrigation projects in Datia, Vidisha, Jabalpur, Sheopur and Rajgarh district. CM Chouhan saw the model of Bansujara Dam project and gathered information about its functioning. CM Chouhan said that the irrigation area has been enhanced to 40 lakh hectares from 7.5 Lakh hectares in the last 15 years. He further mentioned that the state government is making efforts to enhance it further to 80 lakh hectares. While informing about the schemes of the agriculture development and farmers welfare, CM Chouhan said that the day is not far when Madhya Pradesh will surpass Punjab and Haryana in agriculture production. CM Chouhan informed that the Bansujara Dam Project will facilitate irrigation on 75 thousand hectares area of 321 villages of Tikamgarh and Chhattarpur district along with providing drinking water. He said that the project has been named Bansujara because it is in the middle of Ban village of Chhattarpur district and Sujara village of Tiikamgarh district. The dam having 2500 meters length water storing capacity of over 316 million cubic meters, he added.